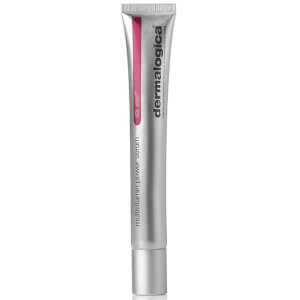 Shield skin from harmful UV damage with the Dermalogica Prisma Protect Moisturizer; a light-activated multitasking moisturizer that offers SPF30 broad-spectrum defense whilst preventing further skin damage caused by external stressors with breakthrough antioxidant technology. Powered by intelligent drone technology which senses visibly light and activates the formula to boost skin’s natural luminosity, the hydrator also helps maintain an even skin tone, thanks to a bio-ferment from Sage. Advanced moisture magnets provide all-day hydration for visibly smooth and radiant skin. Free from parabens, gluten and artificial fragrances/colorants. Water/Aqua/Eau, Homosalate, Octocrylene, Silica, Butylene Glycol, Ethylhexyl Salicylate, Butyl Methoxydibenzoylmethane, Coconut Alkanes, Dimethicone, Glycerin, Dimethyl Capramide, Polyglyceryl-2 Stearate, VP/Eicosene Copolymer, Chlorella Vulgaris Extract, Palmitoyl Oligopeptide, Saccharide Isomerate, Zingiber Officinale (Ginger) Root Oil, Sclareolide, Tocopherol, Camellia Sinensis Leaf Extract, TocopherylAcetate, Coco-Caprylate/Caprate, Glyceryl Stearate SE, PEG-100 Stearate, Potassium Cetyl Phosphate, Arachidyl Alcohol, Dimethicone Crosspolymer, Behenyl Alcohol, Benzyl Alcohol, Caprylic/Capric Triglyceride, Xanthan Gum, Acrylates/C10-30 Alkyl Acrylate Crosspolymer, Arachidyl Glucoside, Ethylhexylglycerin, Methicone, Sodium Hydroxide, Trisodium Ethylenediamine Disuccinate, Citric Acid, Sodium Citrate, CaprylylGlycol, Propanediol, Geraniol, Limonene, Citral, Polyvinyl Alcohol, Sodium Benzoate, Potassium Sorbate, 1,2-Hexanediol, Phenoxyethanol.